In general terms, the Romans coined the name 'Gaul' to describe the Celtic tribes of what is now central, northern and eastern France. The Gauls were divided from the Belgae to the north by the Marne and the Seine, and from the Aquitani to the south by the River Garonne, and they also extended into Switzerland, northern Italy, and along the Danube. By the middle of the first century BC, the Hercuniates were a minor tribe that was located along a narrow band of Celtic settlement close to the Danube, on the western side of the river a little way west of modern Budapest. They were neighboured to the north by the Illyrian Azari and Dacian Carpi, to the east by the Eravisci, to the south by Illyrian tribes, and to the west by a pocket of the Boii which inserted itself alongside the Taurisci. The tribe's name is an interesting one, not least because it closely mirrors that of the Ligurian tribe called the Hercates. Both are named after an ancient proto-Indo-European word for an oak: perkʷu-s, 'perk' plus suffixes. The word survives in English, of course, but Celtic used an unrelated word for oak, 'deru' or 'derwa'. The 'p' in 'perku' became an 'h' (and was dropped entirely by the English). So the name of both tribes referred to an ancient word for oak. The Romans recorded the name of Hercynia silva, the vast Hercynian Forest, which spread eastwards from southern Germany and which proved a serious impediment to Roman expansion. The Greeks knew it as Orcynia - the same name with a slight variation in spelling. This was the 'oak forest', and its name seems already to have been old by the time that it was recorded, in fact so old that 'herk' meant 'oak' no matter who lived there. This implies that it dates back to West Proto-Indo-European, virtually the first arrival of Indo-Europeans in the region. It also means that early-arriving Celto-Ligurians could adopt the name as the Hercates, and later-emerging Celts could do so as the Hercuniates. The tribe is referred to by Pliny and Ptolemy as a civitas peregrina, a wandering tribe that had travelled to Pannonia from foreign parts, most probably following the Danube from the west, skirting the vast Hercynia silva, the forest from which they seem to have gained their name. Three sites have been identified as being oppida for the tribe, all of which are in the region of Lake Balaton (later a medieval march principality called Balaton). Little else is known of them save that they were issuing their own coins by the second century BC. The Hercuniates are already in place in their Pannonian home, a little way to the west of modern Budapest. 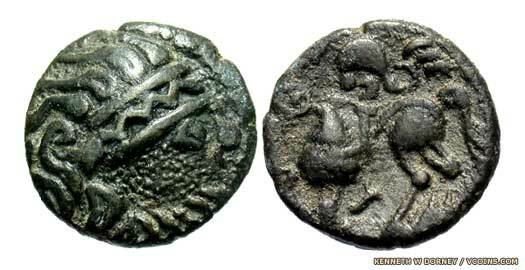 Archaeological finds of locally-made coins are dated to this period. Following recent success in battle at Histria, relations between the Getae and their neighbours in the Balkans undergoes a notable deterioration. Suddenly, under the leadership of Burebista, who is apparently guided by a wizard called Deceneus, the Getae launch a succession of brutal attacks on their former allies. The Celts seem to be first on the list, and the territory of the Boii and Taurisci are laid waste, with the Boii especially being almost genocidally exterminated by Burebista's brutal onslaught. The Eravisci find themselves sitting on Burebista's line of march towards the Boii lands, but they escape him. The neighbouring Hercuniates must also feel highly threatened by the Getae, but no mention is made of them, suggesting that Burebista simply passes them by. The tribe is eventually subdued by Rome, but the creation of the province of Pannonia is poorly recorded by Roman authors, especially in eastern Pannonia. Like the Eravisci, it seems possible that the tribe may become an ally in order to keep it out of the anti-Roman revolt of the Celtic tribes to the south, especially that of the Scordisci.